Plastic lockers work perfectly for those that don’t want to have to repaint or replace metal lockers that have rust or corrosion. The resistance to fade means you will save money because you won’t have to repaint the surface in-between seasons. Water resistant plastic lockers are just the thing for pool areas, spas, and areas with high humidity. 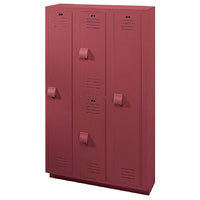 Plastic lockers come in various shapes and sizes, just like metal lockers. Single, double, and six tier box style are available to choose from in different colors. 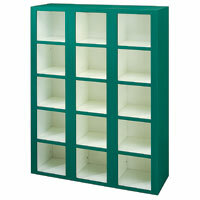 Cubby lockers will resist dents and scratches from its touch plastic design. 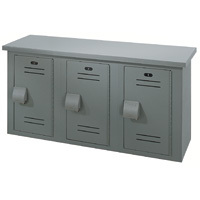 These convenient lockers will not rust or delaminate from moisture that would damage other types of storage lockers. There are many color options to choose from so you can easily match the room it will be in. A further advantage is that there are colors available in 100% recycled materials for those that want to help the environment. Locker rooms have started to become an area that potential students look at when deciding on what school they want to attend. Those that use the locker room will not want it to be run down or look unkempt. Student lockers and employee lockers need to be secure in order to protect a person’s belongings while they are working or exercising. While wood is one of the top choices for locker rooms, plastic may be a better way to go. You can easily lock a plastic locker just as you would with lockers made from metal or wood. Plastic storage lockers will not rust or have paint that flakes off, which can give a negative impression that won’t entice people to use the facility. Plastic lockers provide the convenience and security that wood and metal lockers do, but without the level of maintenance required to keep them looking in top condition. "Z" Style Lockers - More Room! "Z” style storage lockers provide students, employees, and employees with added height to the standard double tier lockers. This allows more area for people to hang clothes to prevent them from wrinkling. Extra wide “Z” style plastic lockers are perfect for those that want to hang up their clothes as well as have space for other personal items. Whether you’re constructing a new locker room or renovating an old one, plastic lockers can be a great way to provide a safe place to store items without having to worry about the wood corroding or the metal rusting. Over time, other materials will require expensive and time-consuming maintenance that is usually avoided with plastic. Since there are so many styles and colors to choose from with plastic lockers, you’re sure to find the perfect match for a gym locker room, pool area, or spa. This article was published on Saturday 02 August, 2008.